Being a working parent doesn’t get you out of helping with homework. “I don’t get home till 6pm there is no way I could get manage to fit in homework as well.” Image: Stock. These are just some of the excuses I’ve heard recently about why parents don’t help with their kid’s homework. Why parents don’t get through the school readers or the online maths programs. Some of the excuses why parents object to homework. And I’m just another parent. I couldn’t image what teachers hear. In a week with yet another study out showing just how much homework our kids are being given – a Roy Morgan survey finding Australian students aged 10 to 13 do an average of four hours of homework a week an increase of 40 minutes since 2007, (but still one-third of the time they spend watching television each week ) – the debate about homework has once again reared its head. No one likes doing homework.. especially parents. Image: IStock. As with every time the same arguments come up. Studies go back and forth over the benefits for different ages (which vary depending on what study you look at). People argue that it infringes on family time, they argue that it is work teachers should be covering in schools and they argue that it is difficult to working parents as they don’t have the time to help their kids and their kids therefore miss out. The thing with that last point is that unfortunately in a lot of cases they are right. While working parents might find it an inconvenience to get through readers and spelling lists and maths problems their kids ARE disadvantaged and there two people leaving them disadvantaged is their own parents. Researchers have found – not surprisingly - that mothers who work full-time spend significantly less time helping their kids with the homework. In fact working mums spend less than a quarter of the time devoted to children&apos;s homework than mothers who work part-time or who stay at home. The study in the British Journal of Sociology looked at mothers and fathers. They found that fathers managed only three minutes on average each day (no matter whether they worked or not) – and working mothers spent three minutes a day helping their sons (researchers looked at children aged 8 – 13) and seven minutes helping their daughters. Dr Killian Mullan, of the University of New South Wales, said that having a mother working full-time reduces the help a child gets at home. He said: "Overall, children are getting less intensive one-to-one engagement with a parent on attainment-related activities when their mother works full-time because the father is just not making up the difference of the time lost." Need help to nail your kid&apos;s homework? Post continues below. It’s not meant to be one of those studies that serves only to induce guilt – though unfortunately it does, doesn’t it? Because really if we wanted we could pull out many surveys that showed the benefits of having a mother who worked for children. 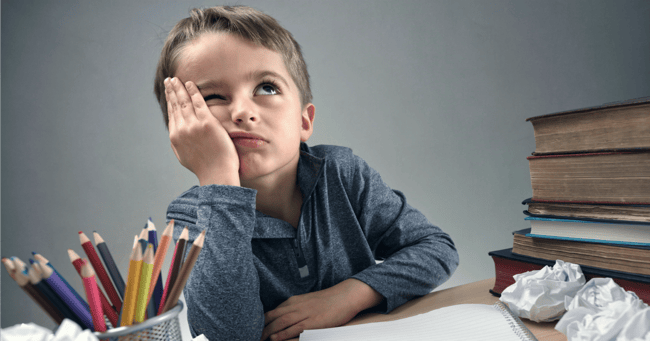 What it should fuel instead of a debate about working vs stay-at-home mums is a conversation about how working parents could manage their time in order to change their attitudes to homework. It should serve to spark both parents to stop making excuses that homework should be something competed at school or that home time is “family time” but look at homework as that family time. Parents need to look at homework AS family time. Image: IStock. I know of families where both parents work in order to simply feed the kids and pay the mortgage. They work long hard hours hoping their children will reap the benefit. So it’s not a surprise that at the end of the week they report not managing to even help their young kids open their homework folders or to read to their children. But it is a disadvantage that will have long term consequences. Two in 10 young people don’t get any encouragement to read at all from their mother and four in 10 don’t from their father – many of them citing the excuses that they are too busy and that homework should be done at school. We need to smarten up. We need to make sure that we find the time, that we re-arrange our priorities and help our children not to fall behind. We need to make sure that if we’ve got the time to watch The Bachelor and flick through Facebook we’ve got the time to open that school bag and dig out some readers. No one likes homework, most of all parents, but its something we need to live with and stop making excuses about. Did you know Mamamia has a parenting podcast? Join Holly Wainwright and Andrew Daddo as they discuss the glorious mess that is family life.